10 Apr How do we get to Benidorm? Benidorm is one of Spain’s main touristic destinations. Hence, it has excellent connectivity with the rest of the towns and cities in the Valencian Community, as well important locations throughout Spain. It is located half an hour from Alicante International Airport (el Altet), which has more than 115 international destinations. It is in a privileged area, which is the Costa Blanca, and therefore 80% of its flights are international. Thus, due to the volume of passengers and freight, it currently ranks in sixth position in the network of Spanish airports. Furthermore, less than two hours away, you can opt for Valencia International Airport. It is one of the top 50 European airports and offers flights to approximately 77 destinations. Furthermore, just 40 minutes from Benidorm, you can find Alicante’s high-speed train station, the AVE. Since it is Alicante’s main station, it offers long and short-distance as well as local services. Its most popular route is Alicante-Madrid, since it only takes two hours and ten minutes, which reaffirms that it is the quickest and most convenient way of travelling to and from the capital. And, if you are worried about how to get to Alicante, at Benidorm DMC we have a wide range of buses and transfers that guarantee direct, rapid and convenient connectivity with the provincial capital. 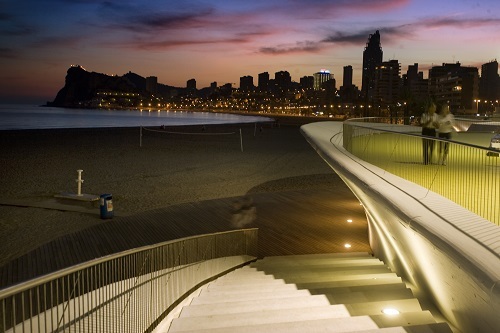 As has been shown, Benidorm has excellent connectivity with the rest of Spain’s towns and cities, as well as with international destinations thanks to its nearby airports with a great variety of flights. Hence, it is the perfect destination for holding corporate events or incentive trips. Do not give it any further thought and contact Benidorm DMC.